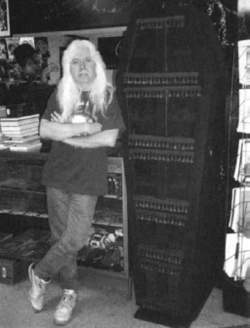 Del Howison, owner of the Dark Delicacies book store. America’s premier horror/vampire-oriented book store, Dark Delicacies, filled a need in 1995 for a book store serving a national (and even international) clientele. The store specializes in horror fiction and nonfiction books and related movies, jewelry, and paraphernalia. Located in Burbank, California, Dark Delicacies is owned by Del Howison and his wife Sue, who opened the store to sell horror in a context largely unadulterated by science fiction and fantasy. Located in proximity to a number of southern California television and film production companies, the store has become a major resource and a site for various documentaries. Authors of new books participate in scheduled book signings held there several times each mondi. Dark Delicacies became one of the principal sponsors of Dracula ‘97: A Centennial Celebration, the grand event commemorating the 100th anniversary of the publication of Dracula. The Howisons organized the exhibit area for the event and coordinated the numerous autograph sessions by the authors and celebrity guests. The store has also become the meeting place for various fan groups such as the Phantom Coaches Hearse Society and the Un-dead Poets Society. The store caters to book collectors and may be contacted through its Website, http://www.darkdel.com/. As the world of Hollywood filmmaking and horror writing became intertwined, the store became a place for both moviemakers and writers to promote their wares, sponsoring multiple book and DVD signing events monthly. The Howisons have also published several short story anthologies featuring writers who frequent the store. Their anthologies Dark Delicacies and Dark Delicacies II: Fear, were nominated for the Bram Stoker Award, as was their nonfiction reference text, The Book of Lists: Horror. Del Howison has appeared in a number of movies, from cameo appearances to a speaking part in Don Glut‘s Blood Scarab (2008). In the process, Del became the only cinema actor to play Renfield multiple times (four in all). Del has also authored a short story, “The Lost Herd.” Under the name “Sacrifice,” it became the premiere episode of the television anthology series “Fear Itself’ on NBC (2008). Howison, Del, and Jeff Gelb. Dark Delicacies. New York: Ace, 2007. 368 pp. ———. Dark Delicacies II: Fear. New York: Ace, 2008. 336 pp. ———. Dark Delicacies III: Haunted. New York: Ace, 2009. 336 pp. Wallace, Amy, Del Howison, and Scott Bradley. The Book of Lists: Horror. New York: Harper Paperbacks, 2008. 432 pp. com)-- Dark artist, Audra Phillips will be unveiling her "Disturbingly Beautiful" art at Dark Delicacies in Burbank, CA. BURBANK -- If the deformed Frankenstein's monster with a lolling tongue by the door of Dark Delicacies scares off some potential customers, they probably wouldn't have liked the store anyway. Since he and his wife, Sue, opened Dark Delicacies 13 years ago, they've amassed a wide variety of horror items. 3 -- color) Frankenstein's monster lurks outside Del Howison's Dark Delicacies shop on Burbank Boulevard. We'll have several studio props people come in looking for items to complete a set,'' said Del Howison, co-owner of Dark Delicacies. Collectors seeking everything they've ever wanted to read about vampires, for example, can find it at Dark Delicacies, Howison said. Next to Panoptikum is Raven's Flight, which can be described as a witches' shop, and a mile or so away in Burbank is Dark Delicacies (``The House of Horror''). He constantly reinvents himself,'' says Del Howison, the owner of Dark Delicacies, a horror book shop in Burbank. As part of a West Coast book tour, they'll read their spooky selections today at Dark Delicacies bookstore in Burbank and Tuesday at Barnes & Noble in Encino. At Dark Delicacies, a little shop of horrors in Burbank that specializes in vampire goods, there's an ongoing philosophical debate about the fascination with vampires. Eerily lifelike masks of horror film actors line the walls of Dark Delicacies in Burbank.